Replacing Email = Happy Customers 🙂 Increased Productivity, Reduced Support Calls, Growth & Profit. Give clients access to ALL of your support systems from one simple ‘IT’ button. 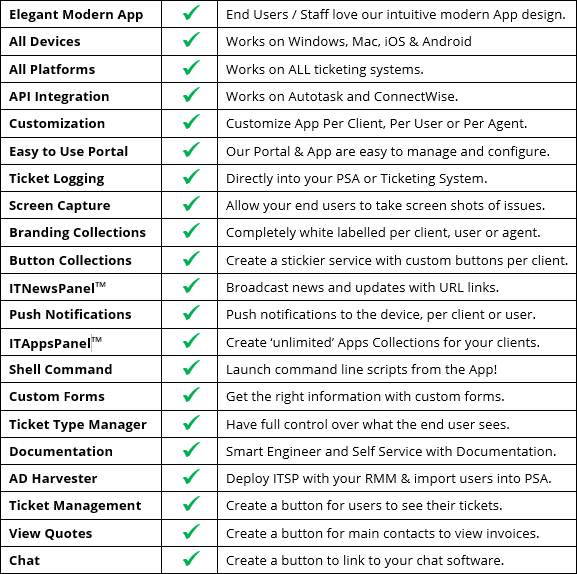 Why Your MSP Needs an App..
ITNewsPanel™ enables you to communicate effortlessly to your clients. ITAppsPanel™ solves the problem of a messy desktop. Create an SOE App collection per client. Our MSP partners are increasing annual profit by $50,000 to $100,000 with ITSupportPanel™. To find out more read our 7 ROI Tips. Product Features Our Partners LOVE! 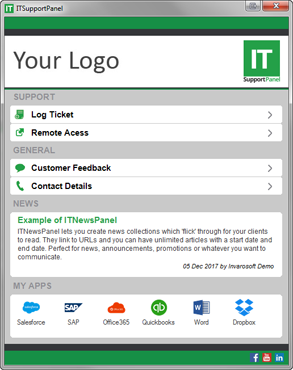 Improve your customer and employee experience by replacing email support with a remarkable desktop and mobile ‘App’ called ITSupportPanel™. 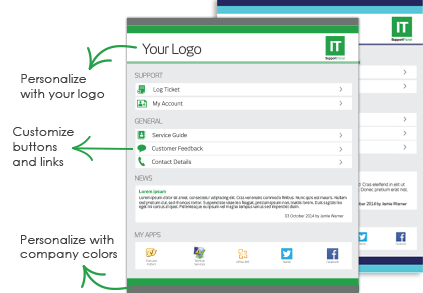 A Customizable App on Every Device: ITSupportPanel™ is your brand, logo and colors on every device. Anywhere and anytime. It’s the perfect way to digitally wrap your services. You can customize the Appearance, Buttons, News & Apps per client, user or agent. Increase Referrals & Create Loyal Followers: ITSupportPanel™ is memorable for end users. Now when a person changes companies from one of your clients, they’ll more than likely remember how easy it was working with you and recommend your services! 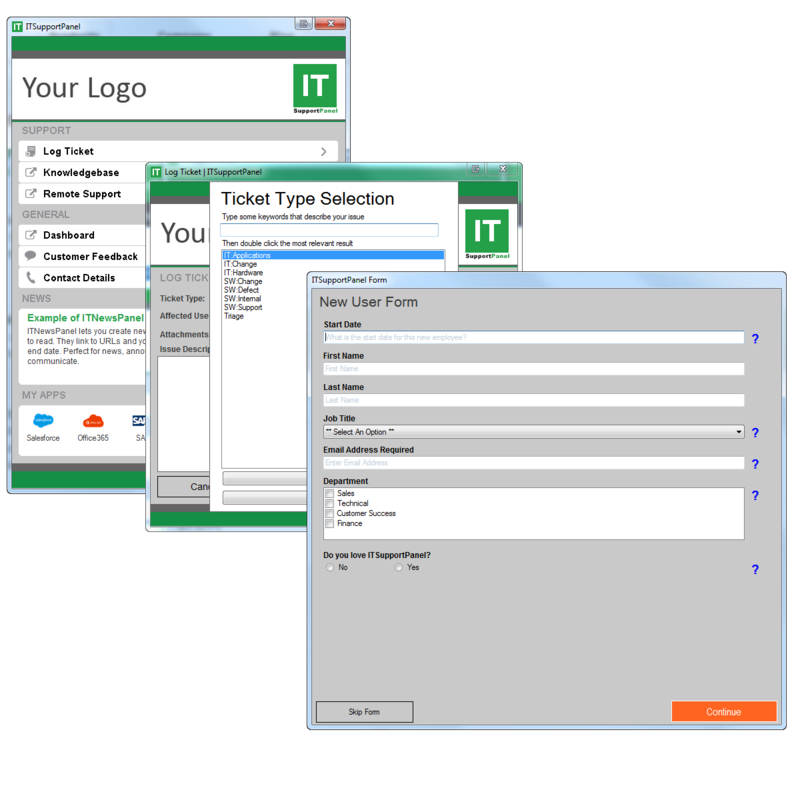 Your Brand or Their Brand: ITSupportPanel™ is feature rich and fully customizable. You can create buttons & links to whatever you need. 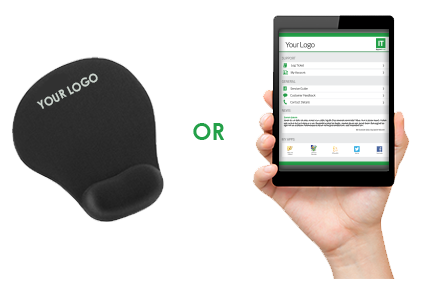 If a customer wants their brand and custom buttons shown, you can create a new appearance. Imagine the possibilities! Engage the end user, add value & make clients happier. 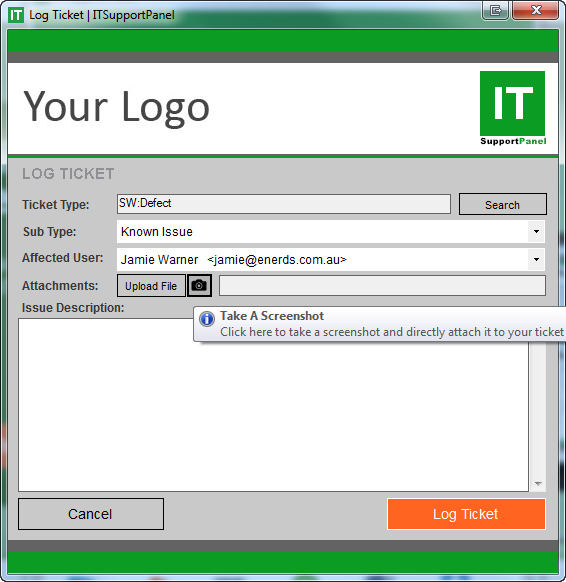 Improve engineer productivity by getting the client to log the tickets in your PSA! Custom Forms: Create forms per ticket type (e.g. New User Request) and per client and when the user clicks the ticket type a form pops up ensuring you get the right information the first time via the App! 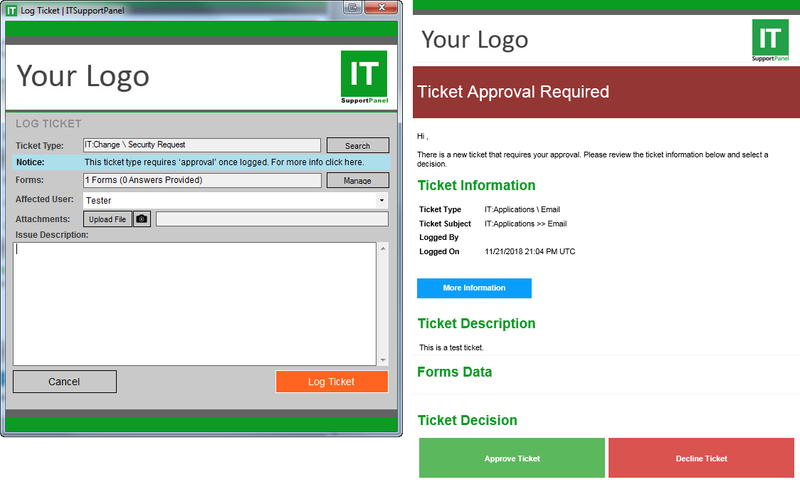 Approvals: Your MSP can now improve productivity by assigning ‘approvers’ to ticket types AND clients. The user see’s a blue bar saying the ticket needs approval once logged and the approver gets an email to ‘approve’ or ‘decline’ the ticket. Perfect when clients want more control and governance over their IT operations. Increase Engineer Productivity by up to $50,000 Per Annum: Most MSPs receive tickets via email, then the Engineer or Service Desk needs to allocate the ticket by selecting the fields in the PSA. ITSupportPanel saves all this administration time wasted every day by getting the end user to fill in the relevant fields when they log a ticket. You can setup the software to match how your MSP wants to receive tickets. Read More Here. 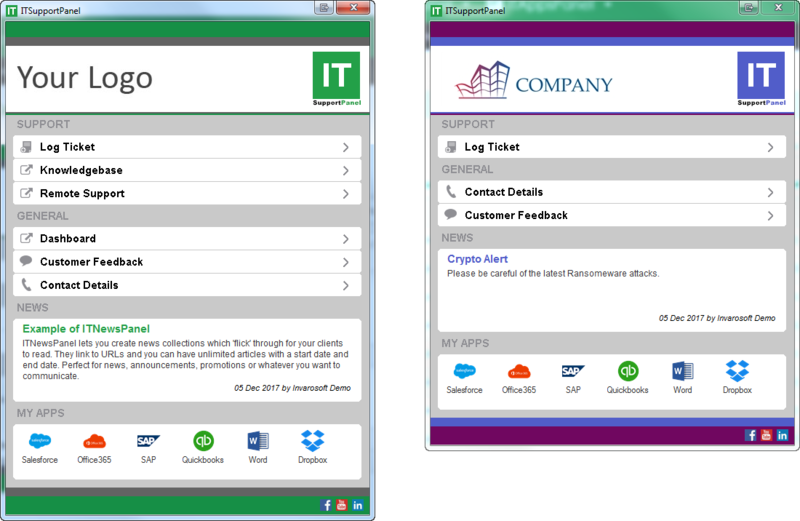 Increase Client Productivity: ITSupportPanel™ gives your clients end users a much easier method to access IT Support. 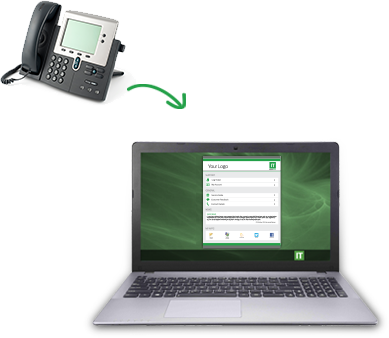 You can reduce their time wasted on the phone for Support by up to 50%. Now you’re adding tangible value! Improve your NPS Score: The number one way to measure your clients happiness is via a Net Promoter Score (NPS) survey. The top global brands have high NPS scores and so should you. ITSupportPanel can help you improve your score by providing them with daily visible value. Reduce inbound support calls by up to 50% & increase profit. Less client churn + more MRR, fees & capacity = a 10x ROI. Screen Capture: By replacing email support with ITSupportPanel you can make it easier for your end users and employees to ‘screen shot’ their issues which reduces calls! Reduce Inbound Support Calls by up to 50%: Our results show that by making it easy for users to log tickets your support calls are reduced by up to a staggering 50%!! With less phone calls, you can close more tickets and better utilize your capacity. Our software pays for itself and should deliver a minimum 10x ROI. Read more about our Top 7 ROI Tips. Get a powerful unique selling proposition that helps you deliver a remarkable experience, beat the competition and win more MRR deals. Push Notifications: Imagine being able to cut through the clutter of email and communicate with branded Push Notifications direct to your end users Windows, iOS and Android devices. You can send notifications to users, clients or groups of people (like your main contacts), you can select the color and whether you want the pop-up to stay on the screen or disappear. Imagine when you on-board a customer and on day one (1) they get a branded push notification linking to your branded cartoon ‘how to use our services video‘. That’s on-boarding in 2019! Win More MRR Deals: ITSupportPanel™ gives you a powerful sales tool to differentiate your services and win new MRR clients. Stand out in the crowd and explain how your business uses innovation to deliver an easier, faster and more visible IT support experience. It’s a competition slayer! Increase Conversion: Changing IT providers is a big decision. Explain how rolling out your branded portal makes changing to your services easy. Staff instantly get visibility of their new provider and improved productivity. Makes your invisible MSP visibly valuable!